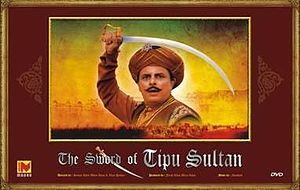 Moving ahead in reviewing Hindi TV Serial The Sword Of Tipu Sultan, we see a lot of stuff happening in the life of Haider Ali and his family and friends. War is definitely not a good thing to talk about. But, there comes the time when it is found unavoidable. In such case one should fought it not only with the bravery but also need to implement right tactics to win it. We see that Haidar Ali and his friends are now working for the king of Mysore (Krishna Raj Wadiyar). They are in the core group of confidantes of the commandant mainly known as Nanjha Raj Ji and follow the guidance of Haidar Sahab, which is, we can say friend, philosopher and guide of Haidar Ali and his friends. In any war important parts are played by the spies as well. This stuff is explored in the war oriented episodes pretty well. In a discussion Nanjha Raj accepts that as they have spies who give them the information from the camp of opponents; the opponents also should have done a similar setup. And it is very true, we see a spy from the opponents is hearing this conversation and he was mixed in the army as a soldier! It is good for a leader to check the realities and rather than having over-confidence, have his feet on the grounds of reality. The dialogs in this conversation are really effective. We see that they are able to track the culprit ultimately. Though Haidar Ali found quite discouraged with it, as their plan of actions have remain no surprise element, as everything is known to the opponents. Purnaiya wisely advise him something, which later play effective role in the battle they ultimately win. Those simple yet effective dialogs are nice to hear when you watch the episode. The war takes due from everyone! And, Mysore Army had to give the blood thirsty battle land, the sacrifice of the brave warrior Haidar Sahab. Haidar Sahab till his last breath thought and did the things in the interest of his motherland and met with his death. It was the only setback for the Mysore army in the battle. All these scenes are filmed pretty well. We must say that the production team have worked really well. And the director and cinematographer did their best to catch the war on the celluloid. Various camera angles play really well. Trained horses and their riders are a joy to watch. We can see a new style to arrange the camera on the top of horse’ head! It works though. The scene where we see Haider Ali and his mates are mixed in the army of opponents in the uniform of their solder, and eventually gain the control from within, are looking childish at places. The scene where the brave warriors are praised and presented with gifts, positions, properties and other stuffs, is not very impressive. The actor playing the king is not so effective. Shashi (as his queen) is able to get her presence felt, though she has no dialog and camera footage for hardly a minute or two. The golden heart shown by Haidar Ali in the court makes him favorite of a lot of remarkable fellows. The explanation about the same done later by Pundit Purnaiya is effective. If to talk about performances Shahbaaz Khan and Anant Mahadevan are scene stealer without two thoughts. Then comes the dialogs. Supportive cast help at various places, but they have mixed performances. The background music is really well. Especially in the war scenes. The script is written well, of course it is written by keeping the book mentioned above as the base, but tight screenplay is tough thing to write. The production quality is good too. Overall it is something good to watch. There are places where you may complain about dubbing, overall DVD quality is good. If you consider the technology available that time, you will surely notice the amount of money spent by the production team to get the quality results. They may not look very much impressive or effective if you compare it with some modern SFX and HD video quality. But again, the good content takes over. What do you think about this article? Did you find this reviews useful to make your decision to view or buy this TV Serial? Do you have any suggestions or comments? Do let us know your thoughts via comments below. And yes, do not forget to share this article with your friends over various social networks via Twitter, Facebook, Google Plus and others. And yes, you may like to subscribe to our RSS feeds and follow us on various Social networks to get latest updates for the site to land right in your mail box.